S.O.S All Surface Scrubber Sponge Is Dual-Sided For Cleaning Both Heavily Soiled And Delicate Surfaces. It'S Durable And Long-Lasting For Everyday Use With The Scrubbing Power On One Side To Cut Through Tough Messes And A Soft, Absorbent Cellulose Sponge On The Other To Clean Delicate Surfaces Including Nonstick Cookware, Marble, Ceramic And Tile. The All-Surface Sponge Features An Easy-To-Hold Shape That Allows You To Clean Hard-To-Reach Crevices Faster And Easier. This Sponge Is Also Dishwasher-Safe So You Can Toss It In The Top Rack To Conveniently Disinfect. 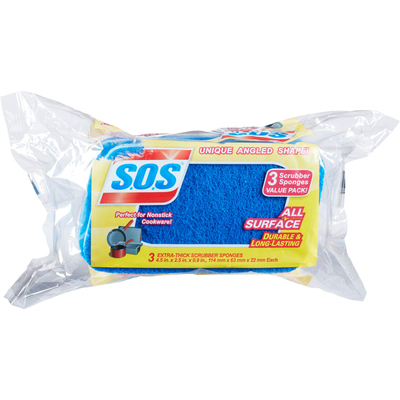 Cleaning Is Quick And Easy With S.O.S..
S.O.S All Surface Scrubber Sponge Is Dual-Sided For Cleaning Both Heavily Soiled And Delicate Surfaces. It'S Durable And Long-Lasting For Everyday Use With The Scrubbing Power On One Side To Cut Through Tough Messes And A Soft, Absorbent Cellulose Sponge On The Other To Clean Delicate Surfaces Including Nonstick Cookware, Marble, Ceramic And Tile. The All-Surface Sponge Features An Easy-To-Hold Shape That Allows You To Clean Hard-To-Reach Crevices Faster And Easier. This Sponge Is Also Dishwasher-Safe So You Can Toss It In The Top Rack To Conveniently Disinfect. Cleaning Is Quick And Easy With S.O.S.